Whereas on Saturday the team played well in nearly all aspects of the their game on their way to a 3-2 win, that was definitely not the case last night. While they got enough from their defense and goaltending to have a chance for victory, poor special teams and a complete inability to generate any offense against Quinnipiac resulted in a 3-1 loss that was not really as close as the score indicates. The result drops to UMass to 4-9-0 on the season. Probably more concerning is the Minutemen are now just 1-4-0 at home, with the lone win coming over AIC. The story of this one is that UMass simply did not get enough shots on net. They compiled just 18 shots on goal on the night, with a high of just 7 in the second period. Even when adding back in the 8 blocked shots by Quinnipiac, the attacking, creative offense we saw the night before in Hamden just wasn’t there. The lack of shots was despite 7 power play chances on the night. They did convert on one of those opportunities, but even that was a bit of a flukey goal when the puck bounced strangely off the back boards to Frank Vatrano who was rushing in to put it in the back of the net. Overall, Quinnipiac’s defense, one of the best in the country, completely stifled any and every UMass scoring chance. Special teams was the other area that hurt the Minutemen greatly last night. Already mentioned was the converting on just one of 7 power play chances. The Bobcats got the go ahead and eventual game winning goal on a short-handed goal early in the third. After keeping Quinnipiac’s power play off the board entirely the night before the Bobcats went 2 for 6 with the extra man on the night, accounting for their two other goals. Defensively, outside of the penalty kill, the Minutemen looked OK. Henry Dill put in another solid performance, making 27 saves a night after making 37 in the first game of the home and home. He had a couple highlight saves, the most memorable for me being a stop where he quickly flashed his blocker to rob a Bobcat forward who had nearly the whole net open to him. The defensemen and forwards in front of Dill did another solid job, blocking a season high 25 shots on the night. The 30 shots registered plus the 25 additional that were blocked shows the dominance in terms of puck possession in favor of the Bobcats. Overall, a split with a ranked team is a positive at this point in the season. It’s too bad that they couldn’t put in a better performance at home yesterday to try to build off Friday’s big win. With their poor record at the Mullins Center so far this season it makes you wonder if the big ice is actually working against the skill and strategy of the team. It probably also doesn’t help that crowds are dwindling and there’s very little energy to spur the players when they play in Amherst. Crowds will obviously be less when the students are home for break, but the 1900 fans at the games yesterday is less than the 2200 that this Saturday after Thanksgiving game has typically drawn in recent years. And frankly, I thought that 1900 figure was pretty generous. Since the athletic department seems reluctant to market or discount single game tickets, something that was very evident when many other Hockey East teams had Black Friday ticket promotions, it’ll fall on the players to create their own energy at home if the crowds stay away. Dill did what he could to keep the Minutemen in this game, at least until the miscue in front of him led to the shorthanded goal that ended up being the difference. Game recap from the Collegian. Conor Sheary is mentioned in this piece on Penguins prospects. The Massachusetts Minutemen got their biggest win of the season last night, erasing an early deficit to beat the #14 Quinnipiac Bobcats in Hamden, CT. It’d be easy to just look at the box score and chalk this one up to Henry Dill “stealing” a game as the freshman goaltender racked up 37 saves on the night. But that would overlook the contributions that came from all over the roster. Last night’s big win was a total team effort. Dill did his part of course, being in good position all night and minimizing rebounds, something that has hurt him recently. The win now brings him to .500 on the season at 4-4-0. I think the key to the game was the job that Dill and the guys in front of him did on the penalty kill. The Bobcats came into the game with the 6th best power play in the country at 25.5%. Sam Anas led the nation in power play goals and power play points. Dill and UMass ended up shutting down the vaunted Anas and his team’s power play, with the Bobcats going 0 for 6 with the extra man. QU got 11 shots on goal during the power play, including 5 down the stretch in the third period, and all were turned away. As for Anas, he was held without a point all night and only managed two shots on goal. Oleg Yevenko was a force on defense, accumulating a season high 7 blocked shots on the night. Offensively we also saw contributions from all over the scoresheet. After the Bobcats grabbed a 1-0 lead late in the 1st period UMass answered immediately with a power play goal from Steven Iacobellis, as Patrick Lee fed him streaking down the slot with a nice heads up pass from behind the goal line. Not only was it important for UMass to respond to the Bobcat goal, but it was good to see the matching goal come from the power play which had struggled recently. Ray Pigozzi got the second assist on the goal and would pick up another assist on UMass’ second goal which was a great cross ice feed to Frank Vatrano as the duo rushed in on Bobcat goaltender Michael Garteig. UMass’ last goal came at a key spot, just seconds into the third period. It all started with Lee taking away the puck from a Bobcat looking to exit his own zone and finished with Dennis Kravchenko making a great pass from the boards onto the stick of Troy Power in the slot to help seal the win for UMass. This was probably UMass’ most complete game this season, executing well in nearly all facets of play. The only negative would probably be faceoffs where they went 24 for 68. But they went 1 for 4 on the power play, kept the highly rated Quinnipiac power play off the board entirely, played solid team defense, got stellar play in net, and successfully challenged the opposing netminder, with all three goals coming from nice heads up passing. If UMass is going to get back on track, last night’s game is a good example of how to do it, by executing well in all aspects of their game. Tonight they’ll get the chance to see if they can play that well consistently when the Bobcats come north for the back half of the home and home. It really was a team effort on defense and the penalty kill last night, but Dill deserves credit for his 37 saves against a quality offensive team. He did a good job controlling his rebounds and squaring up to the shooter, minimizing the good looks available. Quinnipiac didn’t post highlights of the game, but you can watch the entire replay here. Here’s the game story from the Quinnipiac Chronicle. The Massachusetts hockey team will conclude its stretch of five games in nine days with a home and home series with #14 Quinnipiac. UMass has had better results out of conference (2-1-0) than in conference (1-7-0), but this regular series with the ECAC leading Bobcats presents a much bigger challenge than Michigan State or AIC. Quinnipiac got off to a rocky start to their season going 1-2-1 with losses to Lowell and UConn. But since that loss to the in-state Huskies they’ve won 7 of their last 8. The highlights during that time include a 4-0 blanking of then #4 Cornell and a 4-3 road victory over defending national champions Union. This past weekend they travelled to the north country where they dropped a 2-1 decision to Clarkson and then came back the next night to defeat Saint Lawrence in overtime. Quinnipiac is a pretty well rounded team. The Bobcats are scoring exactly three goals per game thus far on the season and are generating a very healthy 31.4 shots in each affair. They’re led offensively by sophomore Sam Anas. His 9 goals in 12 games has translated to 0.75 goals per game, 5th best in the country. His 17 total points is tied for fourth best nationally. He leads the country in both power play goals (5) and power play points (10). That has helped Quinnipiac to a power play conversion of 25.5%, which is 6th best in the country. Other Bobcats to keep an eye on offensively are junior Travis St Denis and freshman Landon Smith who both come into the weekend with 6 goals apiece. Co-Captain senior Matthew Peca has a team leading 10 assists. Junior Michael Garteig has handled most of the goaltending duties so far this season. It was Garteig who played the majority of last year’s 6-1 win over the Minutemen. This year he’s 8-3-0 with two shutouts and a save percentage of .905. It’s really been the guys in front of him who have done the job defensively. The Bobcats are allowing just 22.4 shots per game, 2nd best in the country. The fact that the Bobcats has such a stifling defense is bad news for a UMass team that scored just two goals total against a Vermont team that has similar defensive statistics. UMass has to get back on track with their goal scoring. That should start with their power play, which was 0 for 8 in the two games against the Catamounts. The Minutemen have struggled to produce any kind of consistent offense with the extra man, converting just 12.2% of their power play opportunities. What’ probably more important though is just for the team to get quality chances on net. UMass had decent shot totals against Vermont; 28 and 29. But a lot of those made for easy saves for Catamount goaltender Brody Hoffman. They need to get back to moving the puck and trying to generate scoring from the circles inward. They need to challenge the goaltender and get him moving in the crease. Shot from the tops of the circles are not cutting it. Giving up the most goals in the country (4.64) means there’s plenty of work to be done on defense as well. Assignments are still being missed, players are being caught out of position too often, and the goaltending has been poor. The defensive and goaltending performance so far has been historically bad. In the last 15 years UMass has never given up more than 3.49 goals per game. Even if the team can make strides with scoring, it’ll all be for naught if they don’t keep opponents out of the net. Figuring out a way to shutdown one of the best offensive players in the country in Anas will be a huge challenge. UMass is finishing up their second month of the season this weekend. The freshmen should be integrated into college hockey as well as university life. We should start to see some improvement in play at this time, both offensively and defensively. The Minutemen didn’t play poorly on Tuesday against Vermont. But at the same time they never really were in a good position to win it either. Pairwise isn’t going to come into play for UMass this season so these non-conference games gives the coaches and players a chance to try different things to get the team on track and not necessarily worry about the result. If they lose, they lose. But it’ll be worthwhile if losing puts them in a good spot to take Hockey East points from Notre Dame next week. It is essential that the team starts making some progress toward becoming a winning team. I was informed that one of the places I would send beer drinkers in the New Haven area, Delaney’s, burned down this past summer. The easiest spot for Quinnipiac pregaming is Mikro, located just down the hill from the arena. A scan of the beer list shows they have some really good stuff on. Get Dogfish Head’s Palo Santo if you haven’t before. It’s excellent on draft. On Saturday head to the Hangar and see how much of the stouts and porters are left over from their Black Wednesday event. Hopefully quite a bit since I can’t imagine they did much business in the snowstorm yesterday. Happy Thanksgiving too all the college hockey fans out there! SBN College Hockey takes a look at some of the numbers around Hockey East, including those pertaining to UMass’ goal margin and goaltending. The Hartford Courant has this feature on Conor Allen. The collective groan from Massachusetts hockey fans across the Commonwealth was nearly audible when Catamount Colin Markinson put home a Henry Dill rebound just 47 seconds into tonight’s game. At the time it seemed more like UVM had just gone up 15 to 1 coming out of some never ending intermission from last Saturday instead of having taken a quick lead in the annual Thanksgiving Tuesday game between these two traditional foes. Surely, most thought, that immediate goal would lead to an avalanche of others and the Minutemen would be embarrassed like they were on Saturday, but this time in front of an international TV audience. But, a funny thing happened to that expected narrative. It didn’t happen. UMass would end up putting in a pretty solid first period in the final 19 minutes and at the end of 1 the score was still 1-0 and the Minutemen were still in it. For the majority of the frame in fact they were the better team. The Catamounts would gain the better team title in the second and extend their lead to 3-0 by the end of two. But UMass hung in there, played fairly well in the third, got a token goal in the final seconds of the game, and left Gutterson with a 3-1 loss over the #13 team in the country. Is that good? Is it bad? I think we can agree it was eons better than Saturday. Should we have expected them to win? Doubtful. Should we be happy? I don’t think so. But, we didn’t see a repeat of the lack of effort and pride that punctuated Saturday, so I guess we can call it progress. In terms of the positives to take away from tonight it’s probably more just in terms of the effort. There were times where the team looked a little disinterested, but for the most time their focus stayed on the game and they did their best to stay in it. They didn’t let the game get out of hand. It was good to see Dennis Kravchenko get the late, though meaningless, goal after being held without a shot on goal last weekend. He played much better and got some praise from Tom Caron and Billy Jaffe during the broadcast. There were more negatives on the night, as you’d expect during a loss. While the team matched Vermont’s shot total with 28, they really needed to get more creative and challenging if they were going to win this game. The Vermont defense and Brody Hoffman are just too good to take lazy shots from the top of the slot or the point. UMass desperately needed to recapture some of that creative passing that made the NCAA highlights against Michigan State, getting the goaltender moving side to side across his crease. That didn’t happen too much tonight. The power play was pretty disappointing, going 0 for 4. The team is 1 for 13 on the power play in the last three games. The real killer on the power play was at the end of the second and beginning of the third when they had a two man advantage which would have instantly put them back in the game. But they failed to score during that key opportunity. Their penalty kill is struggling in the last three games as well, giving up six power play goals in 12 opportunities. The defense has to improve. There are still too many turnovers occurring in the defensive or neutral zone. In fact Vermont’s first goal came directly off a missed clear by Patrick Lee. Vermont’s second goal was due to the defensemen pinching too far in and Dill not being able to stop the quasi-breakaway. UMass has another quick turnaround to deal with coming up. After bussing home tonight they’ll enjoy a Thanksgiving in Amherst before playing a home and home with #14 Quinnipiac, starting in Connecticut on Friday. UMass desperately needs some momentum from these games going into their two game series at home with Notre Dame. The games against the Irish will represent the last chance to gain some much needed conference points before the end of the calendar year. They didn’t get any points tonight, but at least the team tried to show that they were not going to repeat what transpired Saturday. Tonight wasn’t that satisfying, but maybe the world isn’t ending either. They got beat by a much better team. Kravchenko’s lack of offensive presence was sorely missed on Friday and Saturday so it was good to see him get back in the groove tonight, even if his goal didn’t come until the game had already been decided. UMass is going to need consistent output from him if they want to reverse their fortunes going forward. Recap from the Burlington Free Press. UMass is at the bottom of the SBN College Hockey Hockey East Power Rankings. Mike McMahon has updated his Hockey East Stat Pack (which got a shout out during tonight’s broadcast). Not necessarily for the faint of heart. 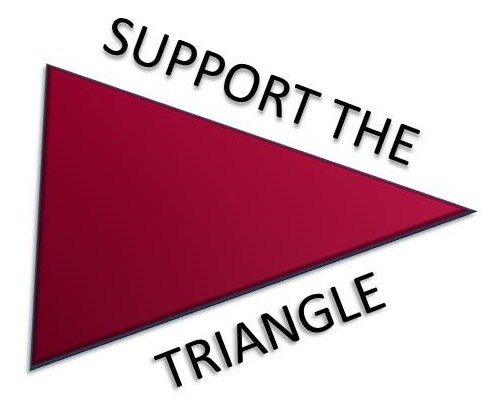 This blog is called Fear The Triangle. The triangle is in reference to the odd looking jerseys that the Massachusetts hockey program wore in the 1990s when the program was restored. The blog name is also supposed to be a way to call out how far the program has come since those triangle years when the team was regularly the doormat of Hockey East and rarely won. It’s also a way to remember the unheralded players during that era that helped build the program to the point that it was competing for a Hockey East championship and NCAA tournament bids in the mid-2000s. Ironically some of those triangle-era players were in town yesterday for UMass hockey alumni weekend and were on hand to witness the 11-1 shellacking the Minutemen took last night. Those triangle teams suffered similar losses, though none quite as bad as last night. Yes, those triangle teams were bad, but that was really due to talent disparity created when coach Joe Mallen was handed the task of taking a program from zero to Hockey East in less than a year and a half. Despite the challenge of going up against the best programs in the country those teams tried and worked hard every night. I experienced more lopsided losses from that time than I care to remember, but I don’t remember a lot of times, if at all, when those teams just flat out quit. That’s what I saw last night though. I team that gave up somewhere during the second period. They quit and decided the game wasn’t worth their effort anymore. I always try to avoid saying a team quit, because that’s something that’s not easily determined. Lopsided losses happen for a variety of reasons. I avoided saying it to describe the third period meltdown against BU to start the season because though they played horrible it still looked like they were trying. Last night they stopped trying. I’ve never seen players just stand in their own zone and let opponents skate by them without getting a body or stick on them and allow them to freely shoot upon their goalie. That’s what happened for the final 30 minutes of last night’s game. No effort. No fight. No pride. The good news is the team won’t have long to sit and stew about last night’s embarrassment. Not only do they play two days from now, but they have a chance of redemption against this same Catamount team. If there is a lack of effort and fight in that game, then we have a serious problem with his hockey program. If they fight hard and execute their game plan against the Catamounts then last night could be see as a turning point. Everyone involved with this program (coaches, players, and administrators) should’ve woken up this morning and asked themselves “What can I do to assure that what happened last night never, ever happens again?” What transpired last night was simply unacceptable. Player of the game goes to any fan who attended last night’s debacle and still decides to attend another hockey game this season. Recap & Box Score from UMass Athletics. Game recap from the Collegian and this piece in which Micheletto apologized to the fans who attended. Burlington Free Press notes that this tied a 1979 Catamount record for most goals scored. Last night’s game started very differently than when these two teams met last month and combined for zero goals and just nine shots in the first period. Instead the Minutemen grabbed the lead right away, just 46 seconds into the game, and the UMass fans who got to the Mullins Center on time thought they just may get to witness an upset. Instead the Eagles would clamp down defensively for most of the game, severely limit UMass’ chances, and roll to a 5-3 win. The loss dropped UMass to 3-6-0 on the season and just 1-5-0 in Hockey East. The second was the lone period where UMass held a shot advantage during the game, outshooting the Eagles 7-4 due in part to a couple power plays during the frame. But it would be BC who would score the only goal in the second. A streaking Quinn Smith would skate into the UMass zone and have his shot deflect behind Dill after hitting a UMass skate. The Minutemen would attempt to climb back into the game in the third, scoring two goals during the period. But each UMass goal was quickly answered by an Eagle goal and some very poor defense ultimately led to the two goal final margin. Four goals would be scored in a five minute span, starting with a power play deflection by Troy Power, his first goal of the season. Calnan would score his fourth goal of the season against UMass just a few minutes later as the Eagles blew by the UMass defense on the rush. Marc Hetnik would score 32 seconds after that to pull the Minutemen back within one goal again. But Noah Hanfin extended the margin to two goals a couple minutes later. BC would control possession for the remaindier of the game and the loss was in the books. It was discouraging to see the improved UMass offense be so dominated last night. The Minutemen were held to just 21 shots during the night, including only 5 during the third period when they were trying to make their comeback. Dennis Kravchenko who had been very hot heading into the off week, did not register a single shot on goal in the game. On defense UMass played very poorly as well. The BC goals that negated UMass’ comeback in the third could’ve been prevented with better defensive coverage. Too often Eagle forwards were able to easily skate right in on net without so much as being touched. Dill did not have a great game, but he didn’t get a lot of help either given the quality chances that BC regularly got throughout the game. I’m not a big fan of singling out “must win games” in November. But tonight’s contest against Vermont is extremely important. UMass does not want to fall to 1-6-0 in Hockey East. That is not an easy hole to try to climb out of. But to have success tonight they’ll have to play much differently than they did yesterday. Vermont has one of the best defenses in the country and strong goaltending. A 21 shot effort against them probably isn’t going to get the job done. I would suspect the Catamount team would be fired up after a narrow loss last night to UConn. Hopefully the Minutemen are equally fired up after not making the most of the early momentum from last night. Pigozzi’s early goal gave UMass an early chance to win the game and later in the game he assisted on the Hetnik score. Daily Collegian game recap plus this piece that looks at the little things that added up to a UMass loss. BC Interruption breaks down the game goal by goal. Hockey East action finally returns to the Mullins Center this weekend. It’s been 42 days since the Massachusetts hockey team last played a league game at home (a game they’d probably like to forget). And it’s been two weeks since the team played a game of any kind. They should be well rested, fairly healthy, and hopefully not too rusty when the puck drops against #12 Boston College on Friday night. These teams last met at Chestnut Hill on October 25th where the Eagles got the 4-1 win. The difference in that one was a couple of two man advantage power play goals for the Eagles in a game that featured 18 total penalties for 47 mins, including a game misconduct for Minuteman captain Troy Power. The game started out as a defensive battle with only nine total shots on goal in the first period, six for the Eagles and three for the Minutemen. Things starting getting really heated in the second period however as 8 total penalties were called during that frame. What I thought the key to the game was that the larger and more experienced Eagles amplified the physicality of the game both before and after the whistle during that middle period. UMass did not allow themselves to be pushed around, but at the same time the chippyness got to them and completely threw them off their concentration and their game. Add in some ill timed penalties, the five on three goals, and an empty net goal and there’s your 4-1 result. UMass will have to make sure not to fall into the same trap this time around. Stand up for yourself, respond in kind, but don’t cross the line and find yourself in the box. At the same time, use the bigger Mullins ice to your advantage and avoid the hit altogether. UMass probably has the edge when it comes to speed and skating, so have to make sure it’s those aspects that dictate the game. BC’s season has not been typical BC since the meeting of these teams last month. The week after facing the Minutemen they travelled west to Denver and split a pair of games there. Ok, that’s understandable. Then their season went off the rails a bit. They were shutout 1-0 by UConn in a historic win for the newest Hockey East member. Then later that same week they hosted rival Boston University and coughed up three different leads on their way to a 5-3 loss to the Terriers. They then hosted Harvard and shockingly lost 6-3 to the Crimson, at one point going down 5-1. They did stop their slide with a narrow 3-2 win against the Michigan State team that UMass split with earlier in the season. Since the calendar flipped to November the Eagles are scoring just two goals per game while giving up 3.20 and have exactly zero power play goals in 26 opportunities. I don’t think there’s ever a “good” time to play a Jerry York coached BC squad, but there is no denying they’re struggling with multiple aspects of their game right now. Henry Dill got the start when these teams played last month but I am hoping to see Steve Mastalerz lead the team onto the ice for warmups before the game. Mastalerz has not had the opportunity to play the Eagles since his sophomore season, but he has played them tough when he has faced them. He is 2-1, the one loss in overtime, against BC with a save percentage of .930 and a GAA of 2.29. The biggest win of his career can likely be considered his 35 save, 4-0 shutout of the then #4 Eagles as a freshman. Injury robbed Mastalerz the chance of facing the Eagles last season and Dill was a logical choice in the net against them earlier this season as he was coming off a strong win against Northeastern in the previous night. But I think the senior goaltender has earned the chance to face BC once again in the last regular season matchup with them in his last season. Vermont and Massachusetts rekindle their rivalry that dates back to the Division II days on Saturday with the teams then heading north to face each other again in Burlington for the annual Turkey Tuesday Tilt. Vermont was one of the surprises in Hockey East last year, winning 20 games and making the NCAA tournament. They’ve picked up exactly where they’ve left off and come into the Mullins in first place in Hockey East and just outside the top ten in the country. The Catamounts have been getting the job done with their defense. They’re allowing just 1.70 goals per game, 6th best in the country. Opponents are only generating just over 25 shots per game, 7th best in the country. The limiting of shots shows it’s more than goaltending as the skaters in front of their goaltenders are getting the job done too. In net it was expected that Brody Hoffman would get all the starts in goal after his strong season last year. And he’s played well enough to, going 5-1-1 with a .918 save percentage and 1.96 GAA. But it hasn’t only been him shutting down foes. Sophomore Mike Santaguida has gone 2-1-0 with an amazing save percentage of .957 and miniscule GAA of 1.15. Whomever UMass faces it’s not going to be an easy task to get the puck by them. Even with the extra man it hasn’t been easy to score against this UVM team. Their .921 PK % is 6th best in the country. Combine that with the fact that they’ve taken the second fewest PIM per game among Hockey East programs and power plays are going to be few and far between against this team. Defensively they’re led by seniors Nick Luukko and Mike Paliotta, both NHL draft picks, and junior Alexx Privitera. Offensively Vermont is a lot like UMass in that they’re getting production from a multitude of players. 13 different Catamounts have scored at least one goal on the season. Reigning Hockey East Rookie of the Year Mario Puskarich leads the team in points with 9, scoring 4 goals on the season. Junior Jonathan Turk also has four goals on the season, though most of those came in a hat trick performance against Northeastern in the season opener. Sophomore Mike Stenerson and senior Colin Markison both have three goals apiece. Vermont is converting their power plays at a 14.3% pace, same as UMass. It’ll be interesting to get the first look at this same UVM squad that ended the Minutemen’s season last year. The Catamount will be facing UConn on Friday before heading back north on I-91 on Saturday. It doesn’t seem likely that the Minutemen will be getting a ton of goals against this stingy UVM team so it’ll be important for them to clamp down on defense and minimize scoring chances themselves. Defensively UMass has been very inconsistent. If they combine their recent momentum in scoring with a concerted effort on defense this weekend they could grab some very key league points this weekend and make up some ground in the standings before it’s too late. Six out of the next seven Hockey East games will be played in the Mullins Center for the Minutemen. Kicking off that stretch successfully is a necessity. Official Weekend Previews from Massachusetts Athletics, Boston College, and Vermont. The Collegian previews the weekend for the Minutemen. They also have a feature on captain Troy Power who will be appearing in his 100th game for UMass tomorrow against BC. For the first time he’ll have his entire family in the stands to witness the milestone as well. Coach Mick made the most of the time off per the Gazette preview. Here’s a preview on UVM’s weekend from the Burlington Free Press. NHL Central Scouting has listed UMass commit Ty Pelton-Byce as a Player To Watch ahead of next June’s NHL Draft. They rank Pelton-Byce, who just recently signed his NLI, as a potential late round draft pick. Pelton-Byce is playing high school hockey in Wisconsin this season and is expected to arrive in Amherst in the fall of 2016. With last week being a bye week I was pretty bored so I sat down with the schedule and went through game by game with my predictions for each one based on how UMass has played thus far and how the rest of the league has played. I did it before this past weekend’s games, but given that most teams split I don’t think I would’ve changed much. I came up with an overall record of 13-18-2 and a conference record of 7-13-2. The 16 league points will put them right around that 8th or 9th seed split for home ice in the first round. The 13-18-2 record doesn’t sound like much to celebrate, but it would be a step forward from the 8 wins last year. If you remember at the beginning of the season I predicted that this team would win anywhere from 5 to 15 games so it would be on the high side of that initial projection. We’ll see though. Still lots and lots of games to be played. From everyone I’ve talked to Brandon Montour is still on track to join the team mid-season. He’s still out there racking up tons of points in the USHL instead of jumping to the pros or major junior so that signals his intention to go the college route. And he’ll have had the time to clear up the clearinghouse issues that delayed his arrival in Amherst. The big question is when UMass fans will get their first glimpse of him. He’s technically eligible to enroll and join the team the first day of Winter session, which is Monday, December 15th. The team has a non-conference game against Northeastern the very next night. Will Mick throw him in with minimal practice time or will he wait until the Catamount Cup games just before New Year’s? We’ll have to see. That’s a tough one. You’ll definitely see it continue in the short term, especially with the five games in nine days stretch coming up. After that it’s certainly possible that one of the goalies will get hot and take the net over full time. Mick was asked the question in one of the recent radio shows and while I forget his exact wording he basically said he likes having the competition to drive the goalies to get better, but sounded like he’d rather one of them make the choice for him by the time the late season stretch and playoffs arrive. Who would that be? I don’t know. Henry Dill probably has a slight edge but Steve Mastalerz has had some bright spots too. It’ll come down to consistency. I think both are capable of taking down a big time opponent but it’s getting that solid effort night in and night out that has plagued UMass ever since Paul Dainton graduated. Whoever can play well 3 or 4 games in a row will find the job is theirs. Hmm. Not sure if that means what beer did I actually drink after the Maine debacle or what? I’m also guessing the debacle in question would be the team giving up the two goal lead in the third on Saturday versus the OT loss on Friday. I don’t remember what I was drinking that night and my Untappd doesn’t show any check-ins (obviously I was distracted). I think a good beer to drown your sorrows in after that game would have to come from New Hampshire though, just to kind of stick it to the Mainers. It would also have to be strong to be effective in its ultimate purpose of helping forget about the loss. Also, being in a bad mood, I’d probably go for something darker and more malty versus hoppy (happy?) and flowery. So given all that I’ll say a Smuttynose Baltic Porter probably would’ve been a good beer to have on hand right after that game. It’s a good question and one that I’m not sure there’s an easy answer for. There will be a lot of fans who think a coach in their third year should be expected to produce a winning season. There are others who would just want to see some kind of progress on last year’s 8-22-4 record. For myself, I don’t think I’ve figured out exactly what I’d consider a successful season this year. I think just saying they need a winning record is too simple and maybe too much to ask given the size of this freshman class and how much they’ll be relied upon to produce offense. I don’t have a specific win total or place in the standings that I’d consider successful, but there are a number of things I’d like to see this year. First and foremost, I want to see the team playing their best hockey at the end of the season. This is actually something I’ve wanted to see for the past two years but it hasn’t happened and the team has sputtered into the playoffs or not even made them at all. It’ll be much easier to be optimistic about next season if the team is playing well to close out the season we’re in. Secondly, the team can’t finish last in Hockey East. Thirdly and related to the last one, the team should finish above teams making their Hockey East debuts. Now this one is a little tougher given recent results, but UConn finishing higher than UMass in their first year in the league with a coach that was under consideration to coach here would be pretty tough to swallow. Overall I think if the team was playing good hockey in February (either winning or losing close games), finishes with 13 or so wins as projected earlier and makes a few teams sweat in the playoffs, I’d be satisfied. Mick gets at least four years. The team could lose every game for the rest of the season and Mick would still be here next year. And I think there’s a good argument that he should be given that opportunity. He and his staff have worked hard the last couple years putting this year’s freshman class together. He should at least get two years to work with them and get some results. Next year’s class is looking pretty solid as well. That’s why I would give him at least four years. Athletic Director John McCutcheon probably views it the same way or has different reasons why he’d keep Mick at least four years so I think you can count on that. If hypothetically he struggles this year and next year does he come back for his fifth and final year of his contract? I’m not totally sure. I’m going to guess yes though and say Mick will get all five years of his original contract regardless of record. McCutcheon has always seemed very hesitant to pull the trigger on coaches who struggle. I think the same would apply to Mick if that was the case. Hopefully it doesn’t come to the point where Mick is coaching in the final year of his contract because that always makes it tough to recruit. Ideally we see some significant progress in the next year and a half and Mick gets an extension before it ever gets to that point. Ok, this one is going to take some real work and thinking. Let’s get the easy one out of the way first. Vermont, Alchemist Heady Topper. Does Heady get perhaps too much hype? Yes. Is it still the best beer in the beer mecca that is the Green Mountain State? Yes. Maine I would have to say Lunch From Maine Beer Company. Allagash has the most great beers in the state in terms of quantity, but Lunch is probably the best downeast beer I’ve had (still haven’t found Dinner yet). For New Hampshire the Smuttynose Baltic Porter I mentioned earlier might be it, but they have a lot of others including their barleywine and wheat wine, that are pretty close. I unfortunately never got Portsmouth Kate the Great when they were making it. Rhode Island is tough because they make a lot of good, not great, beers. I think I’ll go with Decadance from the Trinity Brewhouse. Massachusetts is really tough because there are not only an amazing amount of breweries in the Bay State now, but there’s some amazing ones. It doesn’t help that I have two beers, Lager Ness Monster and Bride Maker, from one of my favorite in-state brewers, Jack’s Abby, which are very highly rated but I haven’t tried yet. I guess Julius from Treehouse Brewing? Asking me my favorite Massachusetts beer is like asking people which of their children is their favorite. It’s not fair. So anyway, those are my top beers from New England. I don’t consider Connecticut part of New England so screw them. Yes. The first time I had Edward I rethought the existence of man and creation of the universe. It’s that good. But I will tell you this, if you decide to drive to the middle of nowhere where they brew their beer, plan an entire afternoon to do so. The sloth-like pace at which they fill growlers is mind-boggling. Don’t get fooled if you see only a couple dozen people in front of you. You’re looking at hours of waiting. Whatever you do, try to avoid bringing a toddler with you because they apparently do not enjoy standing in the same place for a few hours. Best is probably pretty easy. Jon Quick in net obviously. At defense you’d have Thomas Pöck and Justin Braun. Forward is a litter tougher. I’ll say James Marcou, Greg Mauldin, and Stephen Werner. As for favorites I’ll take Paul Dainton in net. Defense stays the same with Pöck and Braun. And at forward I’ll keep Mauldin and add Rob Bonneau and Chris Capraro. These are all subject to change. I’d probably come up with totally different combinations if asked tomorrow. Thanks to everyone who sent in a question! Captain Troy Power outlines how the team kept busy during their recent bye week in his latest blog post. The annual Alumni Game will be taking place this weekend and there’s a huge amount of former players who are making the trek to Amherst to participate. Here’s the current list of alumni who will be there: Bob Jefferson, Carl Burns, John Riley, Ken Richard, Dusty Demianiuk, Craig MacDonald, Jeff Timmins, Randy Drohan, Luke Duplesis, Tim Turner, Jeff Turner, Marty Miljko, David Leaderer, Scott Crowder, Kris Wallis, Chris Davis, Jeff Lang, Jordan Virtue, Matt Walsh, Brett Watson, RJ Gates, Mike Warner, Tim Warner, Will Ortiz, Kevin Czepiel, Dave Alessandroni, Jack McDonnell, Kevin Sullivan, Justin Rafferty, Jamie Benelli, PF Hurley, Joe Culgin, Chase Langeraap, Fernando Fernandez, Shawn Saunders, Sean Regan, Jay Shaw, Peter Trovato, Mike Merchant. The alumni will play on the Mullins ice at 2pm and then attend the game against Vermont that night.